The Jersey Shore gang has some big news. Recently, MTV announced Jersey Shore Family Vacation Part 2 will premiere later this month. Jersey Shore Family Vacation Part 2 premieres on MTV on August 23rd at 8 p.m. ET/PT. NEW YORK, NY (July 26, 2018) – MTV today announced that the highly anticipated “Jersey Shore Family Vacation Part 2” returns with a two-hour premiere on Thursday, August 23 at 8:00PM ET/PT. The first hour will be simulcast globally across Viacom’s international network of MTV channels in nearly 180 countries. “Jersey Shore Family Vacation” features original housemates Deena Nicole Cortese, Paul “Pauly D” Delvecchio,” Jenni “JWOWW” Farley, Vinny Guadagnino, Ronnie Ortiz-Magro, Nicole “Snooki” Polizzi and Mike “The Situation” Sorrentino. 495 Productions Founder & CEO SallyAnn Salsano serves as executive producer for “Jersey Shore.” Nina L. Diaz and Jackie French serve as executive producers for MTV. What do you think? 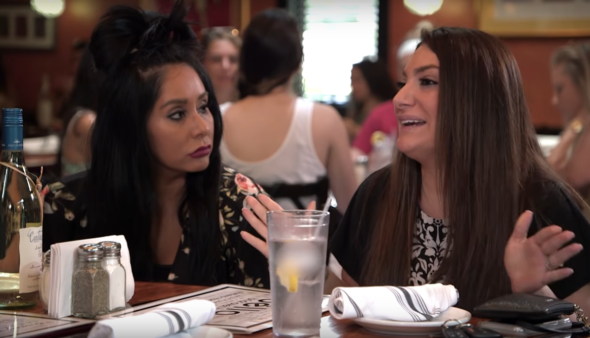 Are you a big Jersey Shore fan? Will you watch Jersey Shore Family Vacation Part 2?